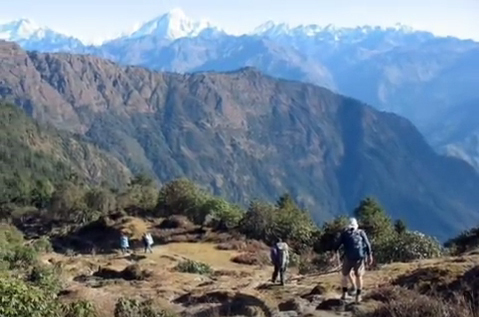 Jugal Himal Trek is a remote area north of the Kathmandu Valley, situated in Rolwaling area. The Jugal Himal Mountain Range forms the border between Nepal and Tibet. The main peaks in this mountain range are Dorje Lakpa and Jugal Himal, which tower over 20,000 feet. The trail takes us through the Indrawati Valley gradually up to the Five Holy Lakes known as Panch Pokhari and then down through the remote Balephi Valley. We reach a maximum altitude of 14,000 feet at the Panch Pokhari. The Jugal Himal Trek is an old trade route between Nepal and Tibet, and we will encounter villagers from the Tamang caste among others. This journey will provide us valuable insight into the ancient and primitive culture of this remote region of Nepal, where it may seem as if we stepped back in time for hundreds of years. Trekkers carry only day pack and walk at their own pace. Day 01 Arrival at Tribhuvan International Airport (TIA) Kathmandu. Welcome with bunch of flower assistance at the Airport and meet with our staff (One of our company staff will be waiting you at the Airport with display your name "......" which is print on our company white board and pick up by our private vehicle and than 20 minutes drive to the Hotel. After few minutes rest in hotel, Visit in our office and have hot/cold drinks (Tea/Coffee) waiting to serve and have join together, One of our staff will brief you regarding the trip. O/N at hotel. - Fully escorted trek with an English speaking license holder local sherpa trekking guide and necessity porters. - All program according to itinerary on full board. - Wage, equipment, insurance and other facilities to staff. - Nepal tourist visa fee US$ 30, with multiple entries for 15 days, you may easily issue the visa upon your arrival at Tribhuwan International Airport Kathmandu. (it will be ready within few minutes) You will require each 2 passport size photos. - Personal Spending money and all kind of drinks (Alcoholic, hot and cold drinks) bar bill, Int'l Telephone bill, hot shower, batteries charge, laundry etc. Tips for guide, porter and driver. (Tipping is expected). Incredibly amazing trek in Nepal Himalayas and when it comes to Rara Lake just out of this world aquamarine Lake, can’t explain the beauty in words, I feel so incredibly blessed that I experienced the real Mother Nature, it makes my heart single. Everything was arranged so well by Skyline treks. I hope to trek with you guys when I plan my next trek. Annapurna base camp trek was one of the charismatic treks that I have done, besides world’s highest mountain the most significant thing of this trek is every day changing in landscape and surroundings and as well the very important part of this trek is that I joined with professional team of Skyline treks in such landscape. This trek in Nepal Himalayas was my first trek with Skyline and experiencing the quality of service throughout the trek provided by the company and if I rate this out of 10 I should rate as 9.9. Dheeraz as trek guide gifted by Skyline to our batch, the amount of kindness and hospitality up in the mountains is not enough to recommend for the entire team of Skyline treks. The trek in the direction of EBC which Skyline Treks and Expedition bestows us was worthy of attention due to numerous of snow capped mountains along with the massive worlds highest Mt. Everest which is the prime hotspots of the Everest region. Over all our trek to EBC is almost too good to be true and this credit goes to our competent guide Sanjay who is all the time extremely helpful to us. We would like to urge if someone is seeking for Everest Base Camp trekking in Nepal then please join with sound great company Skyline Treks for your reliable trek and exalting hospitality. Mr. Madhav and his very enthusiastic team are true ambassadors of the proud Nepali people, its culture, & heritage, and are a shining example of how perfect hosts should be. I (AceAuteur) came into Nepal as a tourist and left as if stepping out of home, to be back again soon. Thank you very much Mr. Madhav and all the staff of Skyline for a truly spectacular experience! See you again soon. We Loi217 used Skyline Trek and Expedition for our first ever trek in Nepal to Everest Base Camp Trekking. Everything were well arranged, no hassle at all to us. Our mountain guide and porter are excellent, attentive, helpful and experience! We are very satified with this and appreciate their helps very much! Skyline Treks and Expedition Pvt. Ltd.
© Copyright 2018 Tours Trek Nepal. All Rights Reserved.